This partnership is more than a simple “logo exchange.” AppScale and Canonical engineers worked closely to create a production-ready Charm that would offer users a full cloud stack (OS through aPaaS) at the click of a button. Our goal is customer success and the best way to guarantee that software is production-ready is through extensive QA and testing. “Charms” are the central mechanism behind JuJu, Canonical’s service orchestration management tool. 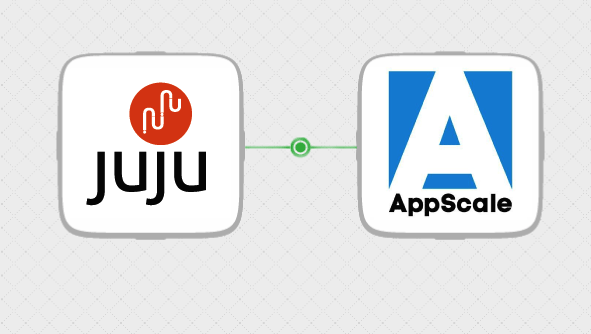 Juju allows software to be quickly deployed, integrated and scaled on a wide choice of cloud services or servers. With AppScale as part of the Canonical ecosystem, users can simply “drag and drop” to provision their cloud resources any way they like. Choose your favorite Ubuntu flavor, add OpenStack as your IaaS (if you like) and top off the stack with AppScale as your application platform. Now you have a completely provisioned environment that can run anywhere (on-premise, GCE, AWS, Azure, SoftLayer) that looks, feels and performs like the most popular application platform in use today, Google App Engine. App Engine hosts over 6 million active applications and those apps, in most cases, can be moved without modification to AppScale or vice versa. Our relationship with Canonical started in 2008 when Mark Shuttleworth and colleague Simon Wardley contacted our freshly funded start-up, Eucalyptus, about working together. That was the start of a very close relationship for many years as we navigated the tumultuous, early days of private cloud infrastructure. Mark is an open source visionary and understood the potential of private cloud. He is profoundly focused on making complex technologies easy to use and empowering the world with open source software. We too believed in the power of open source software and witnessed it first-hand as millions of users from every continent (including Antarctica!) downloaded Eucalyptus. With AppScale, we have set out again to bring easy to use, massively scalable, powerful software to the open source community. AppScale emulates the brilliantly simple Google App Engine development model and when provisioned via JuJu, spinning up a fully provisioned, cloud-enabled software stack couldn’t be easier. Gartner recognized the importance of an open source App Engine and honored AppScale with a Cool Vendor in PaaS award which was followed up by an InfoWorld BOSSIE Award for Best Open Source Data Center and Cloud Software. Our goal and the importance of this partnership is to make it trivial for users to test drive AppScale and discover what our customers and millions of App Engine users have found; that there is no easier way to create web and mobile applications. Check out the AppScale JuJu charm here!